This is a private tour for 1-3 people. We can do as much as you like and can fit into 4 hours. We can drive through historic Route 66-downtown Albuquerque; visit the Indian Pueblo Cultural Center, museum, & store; Old Town-plaza, church, hidden patios, galleries/shops. 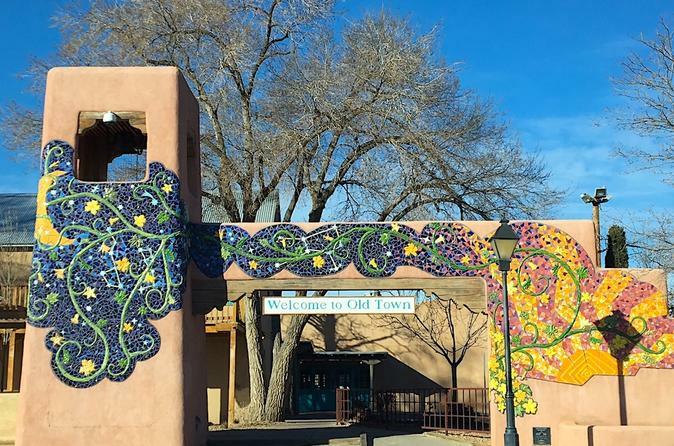 We will drive north on Rio Grande Blvd, following the river through the valley occupied by Pueblo Indians, Spanish settlers and still is home to farms, and wine growers. We can visit historic Los Poblanos Lavender Farm/shop; the village of Corrales; and prehistoric Pueblo Indian village of Kuaua (Coronado State Monument-established during the Classic Period of Anasazi Culture). On our way back to Albuquerque we will see Sandia Pueblo's herds of cattle and Buffalo and ride the Sandia Peak Tram for magnificent views of the area. This is a perfect tour of the present and past filling you with beauty and delicious food. Lunch options are many. Great Photo tour! The Albuquerque Tour begins at the Albuquerque Old Town and Plaza. Old Town is the oldest part of the city with the oldest buildings in both the territorial and pueblos adobe styles. Here we can stroll the Plaza, dine at one of the many restaurants, visit museums, or shop at over 150 stores and galleries. Quiet hidden patios, winding brick paths, gardens and balconies are waiting to be discovered! A stop for lunch at the Pueblo Harvest Café, is a definite option. The Café is inviting with indoor and outdoor seating serving traditional Pueblo flavors and New Mexico style cooking. It gets better! Every Saturday & Sunday at 12 pm the Indian Pueblo Cultural Center offers traditional Native American dances from the 19 Pueblos of New Mexico, as well as Plains Style, Navajo, Apache, and Hopi dancers. Driving north on Rio Grande Boulevard we can visit the historic Los Poblanos Ranch and the Farm Shop that features artisan lavender products made from organic lavender essential oil along with their farm foods collection fresh from the kitchen located by the Rio Grande River and the Bosque (one of the largest Cottonwood forests in the world). Down the road, the Tasting Room at Casa Rondeña Winery allows us the opportunity to sample the entire portfolio of fine wines made on the winery premises. The Tasting Room staff is knowledgeable about wine, and we can not only taste, but also purchase award-winning wines. The gift shop is filled with items from local artisans. We can also have a glass of wine on the patio and walk the beautiful grounds. It is like a quick trip to Italy with Tuscany style buildings, gardens and ponds. The Boulevard continues through a winding path by farms and extraordinary houses to Corrales a small village to the north of Albuquerque. Tours to Corrales and beyond are also available. Next, a visit to the prehistoric Pueblo Indian village of Kuaua, one of many large settlements established during the Classic Period (1325 to 1600 A.D.) of Anasazi Culture. The site, located on the west bank of the Rio Grande just north of Albuquerque, includes the remains of 1,200 interconnected adobe-walled surface dwellings and storage rooms, six kivas and three ceremonial plazas. Also located on the site is a Spanish Pueblo Revival style museum. We can climb down inside a restored Kiva by ladder to experience the ancient center of spiritual life for the Anasazi people. A drive to the Sandia Tram is another possibility. This trip on the Sandia Peak Aerial Tramway transports you above deep canyons and breathtaking terrain a distance of 2.7 miles. At sunset the desert skies produce a spectacular array of color, and your vantage point from the observation deck atop 10,378 foot Sandia Peak in the Cibola National Forest affords an 11,000 square-mile panoramic view of the Rio Grande Valley and the Land of Enchantment. Tour is for 1-3 people. for more please call.